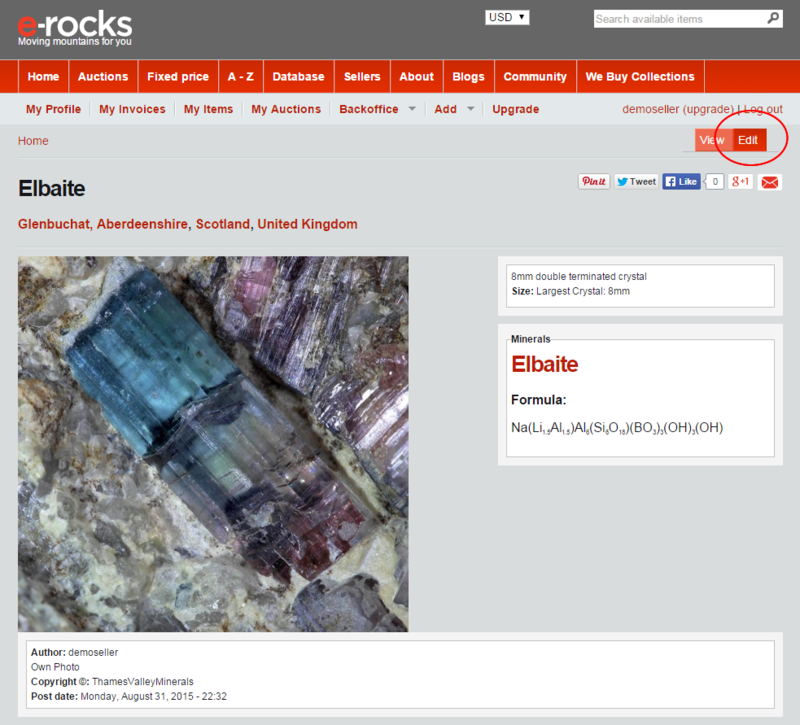 Add Mineral Photo has been created as another way of posting to the e-Rocks database.. 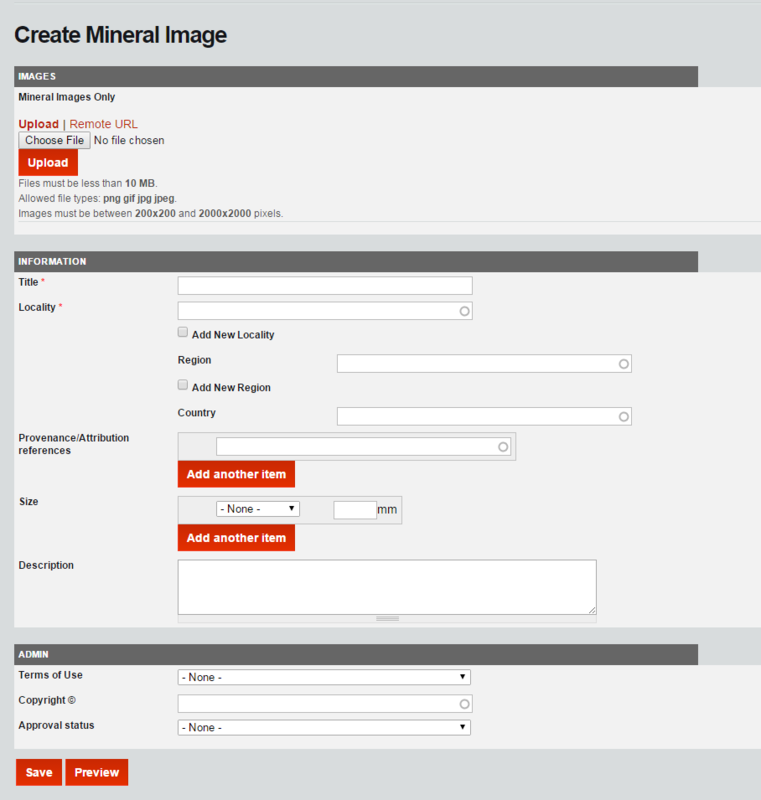 This feature lets you post and catalogue single photos of minerals without creating a collection/item for sale, or a blog post therefore useful for adhoc creation of photo galleries relevant to the minerals/localities referenced. The interface is really simple and captures basic information - so everything is really fast. The simplicity is similar to Facebook and Pinterest etc but different as all items are be filed and cross referenced automatically to our database. All indexed, time stamped and retrievable. This page takes you through the steps to adding a photo. You must own the copyright or have the copyright owners' permission to post a photo. Please refer to the e-Rocks Photography Guide for information about suitable staging and presentation. The Mineral Photos section is NOT to be used for advertising, selling, swapping or posting items for sale. Copyright and proper use are part of the e-Rocks Terms & Conditions in our User Agreement. Please note if you are adding more than one image of the same mineral, you are advised to either add it as a collection item if it is yours or a blog entry if it is someone else's. Roll cursor over button and options will expand - click Mineral Photo. The Add Mineral Photo page will open. The page is divided into 3 logical sections each with a banded heading. Depending on your selection the page will change logically as you work through. Select between uploading an image from disk/folder or by pasting a URL for an online source. Either selection will give you on screen help/direction on acquiring the correct image. For the URL path go to the photo as posted on line, roll over and right click your mouse and select click "copy image shortcut" (IE) or "copy image location" (Firefox) or "copy image URL" (Chrome). Back on e-Rocks go to the URL box, right cick and select "paste". The image URL will be pasted. Then click the Transfer button. With either upload method a thumbnail of the image will indicate success. If you want change the image click remove and start again. Note: the image will not be saved until you complete the page save at the end of inputting. If a Locality or Region cannot be found check the box to add a new one. If you need help please also refer to our guidelines for adding Localities/Regions to e-Rocks. The rest of this section is not compulsory though it is very useful for other users to know as much about the entry as possible. The last 2 fields are to help us track and credit the use/copyright of any image to the correct person. The last buttons on the page let you "preview" or "save" your image. Currently all Mineral Photos are set to "published", this means once saved the image will be visible on the site. Click the Preview button, to see the compiled page before saving (make sure you click Save) after reviewing. Click Save to save and close. Once saved you will see your page, there is an Edit button to let you make changes if necessary.